I’m not a bike racer. Depending on your perspective, I’m either a washed-up old has-been, or merely a would’ve-wanted-to-have-been. But, having raced for over a decade, I can fake it pretty well, if I choose my races carefully. Criteriums require a lot of sprinting, for which I have neither talent nor conditioning. Short hill climbs favor climbers; I’m not built for them. Regular-season races favor those who race every weekend and follow a fairly regimented training program, which I can’t be bothered with. So if I race it all, it’s generally either an event that’s too awful, by its length and difficulty, for most racers (e.g., the Everest Challenge), or is held out-of-season. The Mt. 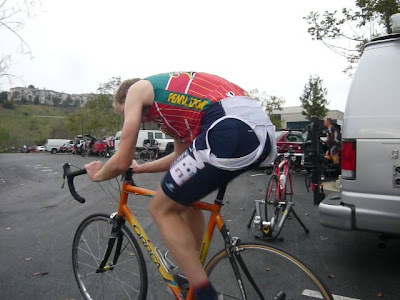 San Bruno Hill Climb takes place every year on January 1, a day when (in theory) most people ought to be too tired and/or hung over to participate, and nobody in the northern hemisphere should be in anything approaching race shape. Perfect for a guy like me who rides the same amount, at roughly the same intensity, all year round. Perfect in theory, anyway. In reality, bike racers are an irrepressible bunch, the kind of people who really ought to get a life. My category (Masters 35+) fills up every year at Mt. San Bruno, as do most of the other categories, and the racers show up fit, trim, bright-eyed, and bushy-tailed. Still, it’s not too far a drive from my home, so I can pretty easily assemble a small entourage for it (plying my wife and kids with hot cocoa). This year was my third; I raced it in ’06 and ’08, and this year set out to improve upon my performance from last time, when I was over a minute slower than in ’06. 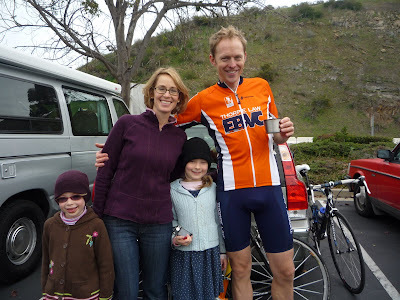 I met up with a teammate, Mike Ceely, who—being an old-school type—got his warm-up riding to the race. In his case this meant coming straight from a New Year’s party that lasted into the wee hours. Just for fun, he wore an old jersey from a long-ago bike club, Team Milwaukee (its official name, in smaller lettering, being “équipe la merde”). That’s him in red below, having a laugh with me and an old buddy of his (in blue). I can’t remember what was so funny. One new development in the sport that’s becoming increasingly common is the timing chip, which automatically records every racer’s time. I first used on in 2003 in La Marmotte, a cyclo-sportif in France; I was required to put down a deposit (something like 10 euros) for it. They had them this year for Mt. San Bruno, which was the first time I’d seen one used in such a minor race. It was a small strip of foam rubber with adhesive backing and a chip embedded in it that was mounted to the racer's helmet. I guess the idea is to speed up the results; I can’t say that it did, however, as the results still weren’t posted when I left, an hour after I finished the race. Still, the timing chip is a nice idea. Yesterday I was trying to find results of this year’s event online, and though I couldn’t, I did find somebody’s blog describing a blow-by-blow of the Masters 45+ race. It was written well, but I couldn't help the feeling I'd read this story before. Unless somebody rides off a cliff, catches himself on some shrubs, climbs back up to the road, gets a fresh bike, and goes on to win (all of which the Frenchman Laurent Fignon actually did once in a Tour de France stage), there’s generally not that much to get excited about in a blow-by-blow of a local bike race. This is especially true with a race like Mt. San Bruno. For one thing, the race is too short to allow for some master plan to be carried out. Meanwhile, its being uphill means the speed isn’t that high, so drafting—and thus tactics in general—don’t actually matter so much. Of course, at the summit I heard all kinds of racers telling all kinds of tales, all full of tactical intrigue and strategic brilliance—the whole “chess-game-on-wheels” bit. I was hard pressed to believe any of it. In a race like this, there are some people you can keep up with, some you can’t, and others who can’t keep up with you; sometimes you can draft others and sometimes you can’t; above all, the grade sorts out who is strongest. Thus, I’m not going to bore you with anything that happened between the time the race started and when I crossed the finish line. I went hard and then it was over and that’s all there (ever?) is to say about the race itself. But I wouldn’t have led you this far if I didn’t have a story to tell. My story begins shortly after I crossed the finish line. I took a few minutes to catch my breath, then learned that we couldn’t descend back to our cars until the last rider had finished. I had suffered terribly, breathing like a malfunctioning turbine about to blow out its bearings, my tongue dried like jerky from hanging out in the wind. The race had been so hard that one of the only things that kept me going was knowing that, not long after I finished, my suffering would end (whereas most of the rest of America would still be painfully hung over). Then I thought: hey, speaking of hangovers, where’s Ceely? He hadn’t felt too well after his warm-up, and had no lofty goals for this race—he simply intended to treat it as another side-trip in his comprehensive tour of the many avenues of human suffering. There were gobs of racers at the summit so finding him wasn’t an easy task. I couldn’t remember what color his jersey was, so I had to scan the whole crowd for him. In the process, I saw this one dude who looked just awful—far worse than anything I’d expected to see. It was an amazing sight and then, suddenly, I realized, oh my god, that’s Ceely! I swear to it: although I was looking for him, I didn’t even recognize him at first. He looked downright unwell, and I suppose he was. Fortunately, he had filled his bottle with tonic water left over from the party, which was like nectar from the gods for both of us. (I’d not brought a bottle and had been regretting it.) Eventually his color returned a bit and we made our way down the mountain, taking a wrong turn at one point. (Perhaps because I seldom drive, I’m a lousy navigator and thus hopeless follower who would practically trail a drunk driver right off into a ditch). We had a big thermos of good cocoa, two excited children, and warm clothes awaiting us at the car, and following that a big, hot meal at a groovy Berkeley restaurant overlooking the bay. Not a bad start to the year. Though I aggravated a feisty virus by racing Mt. San Bruno, It’s possible I’ll be completely recovered in time for the 2011 or 2012 edition. Until then, happy new year from albertnet! They finally posted the results. I finished seventh, in 18:03—a personal best for this event. I have to say, I’m pretty pleased with that. Yay for Dana and his PB in the event (a "Pabst Blue" if there ever was one). "Most of the bikes you see are more expensive than the cars they came in on." Bikers are a funny bunch, and you're no exception. Actually, you are the exception in that you are actually funny, as opposed to "funny".